London is the best experience of my life until now because in London it is possible to meet people from all over the world, which is fascinating because everything becomes an opportunity to learn something new. For those who do not speak English fluently and want to learn English, a simple stroll in London can become a great adventure. This did not happen specifically in London, but began and ended here. 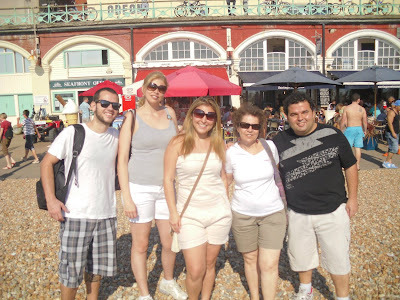 In late September, I went with a group of Brazilian friends to see Brighton, the seaside town in the south of England. We intended travel there on a Sunday and decided to wake up earlier in order to best take advantage of the trip. However, the alarm did not ring on time and we wake up one hour late. At this point, we began to rush to pack up and leave as fast as possible for the day. As we were a group of six people, and we were already late, we left the house around 11 am, instead of 8 am, as we had agreed the previous day. We went to London Bridge Station to get the train that would take us up to Brighton. One of us did not have the ticket, so we had to wait in a long line to buy it. More time passed and we had not left yet. After some time, we checked the time of the next train to leave and found that in 2 minutes. We had to run. Bags, cafes and tickets in hand, we passed through the turnstile, going up a ramp running when we found out that the correct platform was not that way, but on the other. We race back to the other side and so we entered the train, the door closed. We did it! We began the journey comfortably sitting quietly and then, in one of the stations, the train was stopped for longer than the normal time. We looked around and realized that all the passengers had left and just we were still on the train. We went down to ask what was happening and the staff informed us that we should have left at the previous station to change trains for Brighton. We decided to go back and get off at the previous train station. We walked down the platform and looked right, when we climbed all the stairs, an official realized that we had cheated and made us go back up the other side. There was a train approaching, which he told us was the train to Brighton, so then we ran again until the right platform, but the train was packed and there was no place for us all, and as we were in a group, we decided to wait for the next train. A friend had boarded and we saw that the door closed and he went alone. After a few minutes another train came and the rest of our group boarded. Now everything was quiet. Two stations later we were told that we would have to exit the train and catch a bus that would take us up to Brighton. We ran again because there was too many people and the bus probably would not have seating for everyone. We asked where the bus was and the official gave us the wrong direction. After running a few more minutes, we pressed on through the other tourists and entered the bus. A friend and I ran to the top of the bus so we find a place to sit, but was not sure if our friends had managed to enter the same bus. We called and they told us that they were standing on the bottom. Ok, at least everybody was there. After around 1 hour because the traffic was intense, we finally arrived in Brighton. We caught up with the friend who had been on the first train. It was 2.30pm when we eventually saw the sea. None of us believed it had arrived! After much running around we enjoyed the rest of the afternoon on the famous beach of rocks and cold water. We were so tired that we lay on the rocks a few minutes just resting and admiring the blue sky. It was a beautiful day, few hours on the beach, actually, but worth it.